In a proper banana boat is placed a BANANA, split lengthwise with one scoop each of VANILLA, STRAWBERRY and CHOCOLATE ice creams covered in crushed PINEAPPLE, STRAWBERRY topping and CHOCOLATE syrup, garnished with WHIPPED CREAM, chopped ALMONDS and three BORDEAUX CHERRIES. 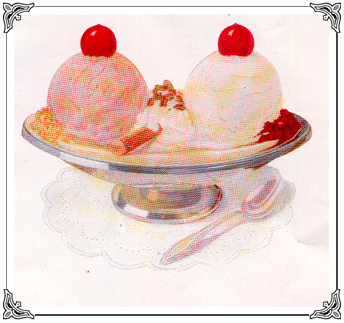 Originated in 1904 by pharmacist David Strickler in Latrobe, PA. An apprentice, Howard Dovey, brought the BANANA SPLIT to PHILADELPHIA where he attended medical school. Dr. Dovey is credited with popularizing the FAMOUS dessert by instructing PHILADELPHIA soda dispensers on how to make a SPLIT properly. This swinging swashbuckler was born in 1912 by a middle-aged pencil sharpener salesman named Edgar Rice Burroughs. As the story goes, a supple young man [a generous serving of VANILLA] with Ape blood [CHOCOLATE SYRUP] is raised on tropical fruits (BANANAS & BERRIES) and crowned King of the Jungle [ALMONDS and a WHIPPED CREAM headband]. This dessert’s Intelligent Design makes for a SLIPPERY slope and can SPLIT audiences right down the middle! A smaller variation of the American classic, inspired by Louis Prima’s 1949 tune for that waist-conscious lady or man. A BANANA sliced into coins laden with CHOCOLATE and PEANUT BUTTER ice creams coated with HOT FUDGE, PEANUT BUTTER SAUCE, spanish PEANUTS, and finished with WHIPPED CREAM and two CHERRIES. Served with a glass of plain water for him.